Watching an announcement on the news today of a lowering in interest rates, the relief is palpable. ‘Back to normal.’ We can forget the crisis, people think, the worst is over, now back to regular life. But it is not so. ‘Regular life’ involves chewing up and breaking down – consuming – more of the earth’s resources every year than it can replenish. It involves buying too much for prices that don’t reflect the cost of growing the material or putting together the product; it involves seeking sanctuary in metal boxes to go places where we may not need to travel, in building more and more, spreading concrete on grasslands, orchids, tree stumps, badger dens, all in the interest of having one’s own space. Wearing T-shirts inside in winter, and having to bring a jacket in summer because the interiors are kept so cold. Eating what we like, when we like: flying tons of papayas and roses from countries where people are terribly malnourished, so we can forget the seasons and the rhythms of the year. Regular life is insupportable, unsustainable: we can use the crisis to accept and practise new ways of being, or we can try to ignore the inevitable until it all comes crashing down. The one thing that is absolutely certain is that ‘acting as if’ we are not overusing resources will never make it true. The finite nature of the resources is real, and it is real for everyone. We have been fortunate in forgetting about cholera in Europe, as it doesn’t cause epidemics often. We forget about lack of food (as opposed to lack of good food) as it is the poor in other countries who tend to have to deal with harvest failure due to drought in their subsistence plot, or the hungry time before the harvest is ready. We unthinkingly hop into our car for a journey, without questioning if the journey is necessary or if we can travel by another method. We must stop acting out of unthinking habit. Global change, loss of fuels, and migration from drought-stricken areas are threats to all of us. Pretending otherwise will not make the collapse impossible but rather more painful by lack of mitigation by planning. 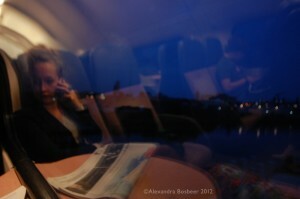 I am currently working on a photography project about the visual experience of train travel. I have been wondering what it is about trains that people don’t like. One aspect is certainly sharing space with other people, with strangers. I knew someone once who chose to get stuck in traffic for up to two hours every day, irrationally eschewing the cheaper and faster train option for the privacy of her own little box on wheels. Consider that the people sharing the train with me are not strangers. Each person faces the same challenges, boredoms, helps, and worries as every human. Their drama is played out in the train, whether in phoning a friend about a breakup with a boyfriend or reading the newspaper or simply watching the landscape go by. The same culture which supports dozens of reality TV shows shuns being in the same car with real life. Going by train in different countries is also fascinating in how it highlights the social attitudes of the culture. Two European countries: one which refuses to inform passengers of the track until a mere 10 minutes before departure, creating a hovering crowd of anxious passengers watching TV monitors and then rushing to the announced platform as a chaotic mob, stumbling over baggage and leaving the elderly behind. Am I reaching too far to see reflected here the inequality of this same society, the division between those with the connections to know how things operate, and the have-nots? It is certainly in very stark contrast with the transparency of countries where the track is known in advance and passengers are welcome to make their leisurely way to the right location, taking extra time to wheel bicycles up the ramp beside the stairs or take a lift with heavy baggage. The train is way to get where you want, together with a number of other people, people with whom we share the same future. It is perhaps an excellent metaphor for directing our way through a changing landscape. There are quiet cars for those who focus on their work, and free internet for those who need e-mail. The passenger on the train has her hands and attention free to read, write, or muse. I call on those who need to get from one place to the next, to take the train.